Travelling is a great way to experience different cultures and one of my favourite destinations is Kyoto, Japan. The food you eat, the sights that you see, the places that you stay – all things which are essential to getting the most out of your travels and learning about how the Japanese live their life. An important part of travelling is also to make sure that your travel insurance covers trip cancellation, delayed baggage and other contingencies. Budget Direct Insurance provides excellent cover and is offering 20% off right now. In this article, we are going to be discussing Kyoto and some of the foods that you should try while you are there, the best sights to check out, how to get around, and the best places to spend your nights at – so let’s get into it! Sightseeing is an important part of travelling and much like the rest of Japan, Kyoto has a lot of different sights to check out during your time there. Nijo Castle. This castle, originally built in 1603 with the intention of becoming a government building, has complex architecture and is one of the most outstanding landmarks in Japan. The most amazing part of the castle is the Ninomaru Palace; five different buildings which are linked together with corridors and which have been painted delicately. For the art fans, there is also a gallery on-site! Kyoto Imperial Palace. Although the Kyoto Imperial Palace has been destroyed many times as a result of fires, the Japanese have continued to rebuild it each time and it still stands strong to this day. On this landmark’s grounds, there is the Emperor’s Residence, the Courtroom, the Imperial Library, and many other buildings. 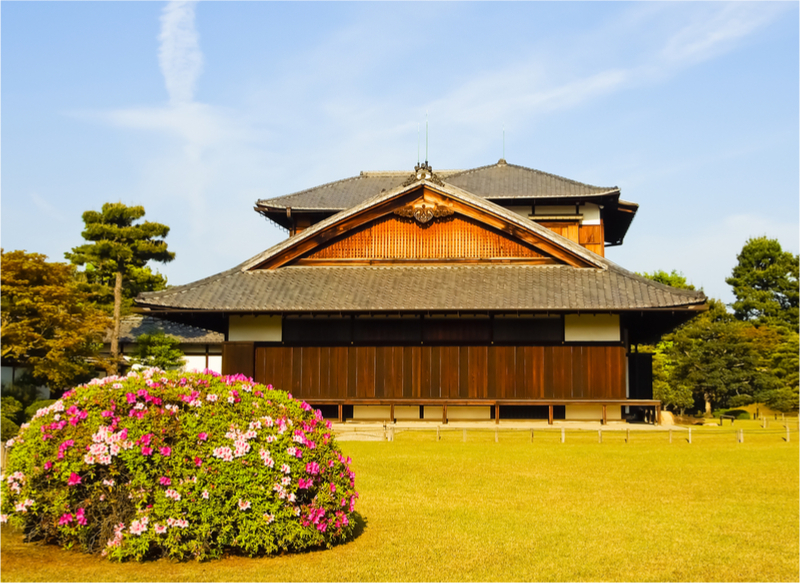 As a tourist, you are able to access Kyoto Imperial Palace unattended although if you hope to get inside of the palace itself, you have to pay for a guided tour – don’t worry, it’s worth it. Fushimi-Inari Taisha Shrine. 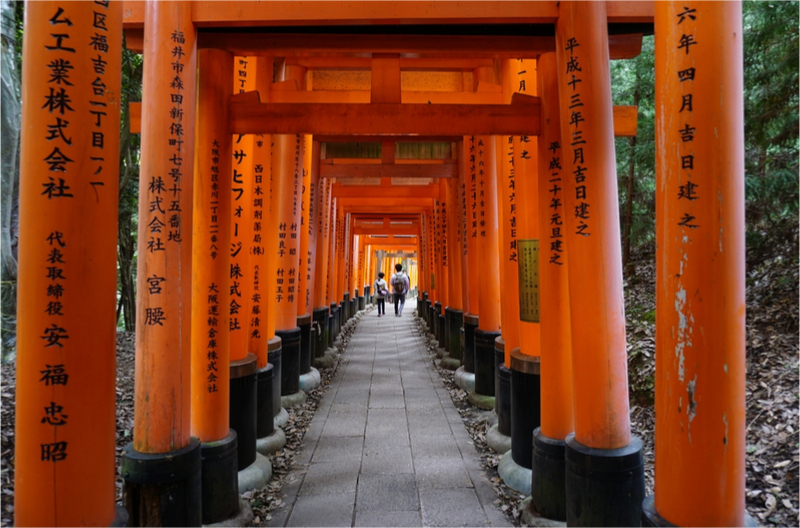 The Fushimi-Inari Taisha Shrine has been around for thousands of years and is a must-see for anyone who is visiting Kyoto. While the main attraction is the building, the majority of people choose to walk through the bright orange arches which takes you about two hours in total. There are also a lot of notable sculptures placed throughout the property. The Kyoto National Museum. Japan has a rich artistic history and while it’s not something that they’re known for, they have a lot of interesting art collection on show at The Kyoto National Museum. One of the most notable artists’ works that they have to show is that of Takeuchi Seiho. Katsura Imperial Villa. If you’re looking for a relaxing day out in Kyoto then this is the place to be. The Katsura Imperial Villa was originally designed for royalty although over the years has become a historic garden that is open to visitors. Another aspect of travelling is the food. Every country eats different types of food and for the most part, it’s food that you aren’t able to cook at home (as some ingredients are too expensive or they are cooked using specific cooking techniques). 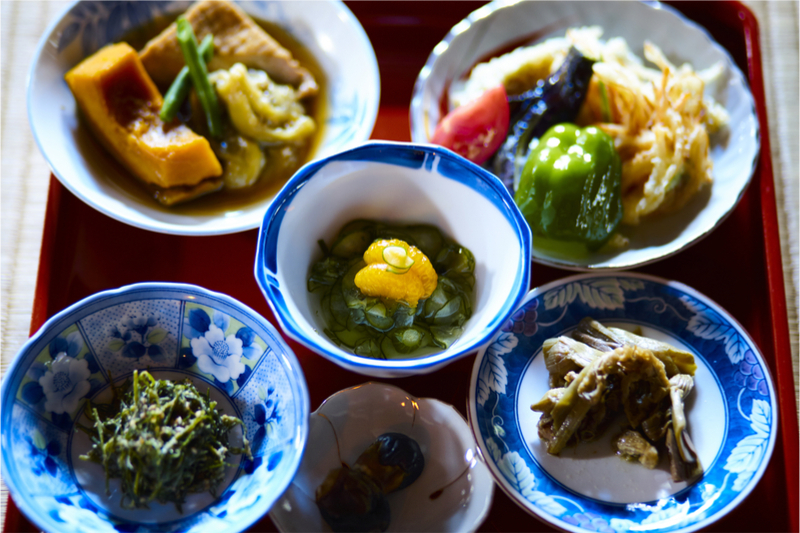 This is why tasting the local Japanese cuisine is definitely something to be excited about! Sushi. Starting with the most obvious dish, Sushi. You might think that you’ve eaten sushi at home but when you eat sushi that a professional sushi chef has prepared, you’ll be mesmerised. Some of the best places to get sushi are Hyotei, Gion Karyo, and Gozanbo. Tonkatsu. Tonkatsu isn’t as widely known about than sushi is, but it’s still a delicacy. Tonkatsu is a piece of seasoned deep-fried breaded pork. It is typically served as a part of a curry, a rice bowl, or even on a sandwich. The best place to get Tonkatsu is from a restaurant chain called Katsukura. Shojin Ryori. Not a fan of meat? Shojin Ryori is a vegetarian dish that consists of minimal seasoning, vegetables (such as broccoli, kale, fine beans, etc. ), and a sprinkling of sesame seeds. Each ingredient is cooked specifically to bring out the taste of everything – making it a very delicious dish. There are several vegan restaurants in Kyoto including Shigetsu and Veg Out. One of your priorities when travelling is to find somewhere to stay that can accommodate your needs without extravagant costs. Below we have made three short lists, categorised by their price range, to help you find a place to stay during your time in Kyoto. Luxury Hotels. Kyoto’s luxury hotels are somewhat similar to what you’d find if you were to travel anywhere else in the world. Big names such as the Four Seasons and The Ritz-Carlton can be found in Kyoto while there are smaller, and locally branded, hotels such as the Hoshinoya Kyoto hotel, which is submerged by the edge of a forest. Moderate Hotels. If you want a sense of luxury but you don’t have the money, you can still enjoy a luxurious environment without going out of pocket. There are several reasonably priced hotels in Kyoto such as the Mitsui Garden Hotel and the Kyoto Brighton Hotel. On-a-budget Hotels. Travelling and looking to save yourself some money? 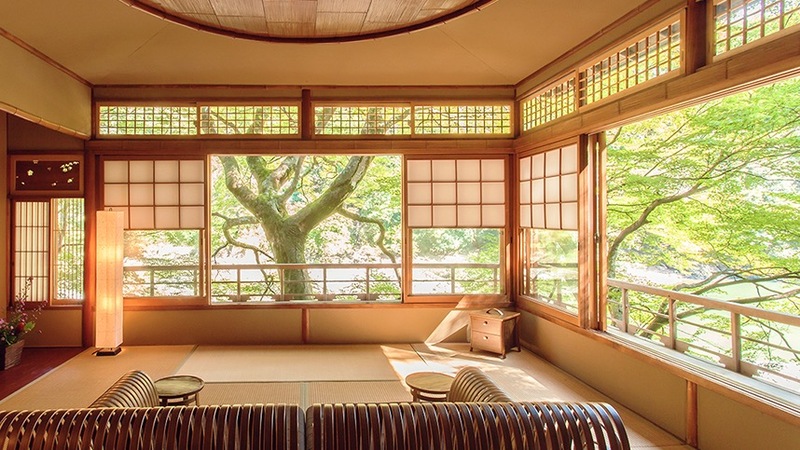 There are plenty of places in Kyoto to stay cheaply; ideal for anyone who’s just there for seeing the sights and won’t be spending much time in their hotel. Sakarau Terrace, Daiwa Roynet Hotel and Hotel Gran; all cheap places for you to stay. Fortunately, due to Kyoto’s public transport systems, navigating throughout Kyoto is extremely easy and thus is a tourist-friendly place to visit. When travelling around Kyoto you can rent a car, take a local train, or use a highway bus depending on where you’re going. If you’re interested in visiting some of the sights that we mentioned previously, we can help you out. Nijo Castle. You can get to Nijo castle by going to Kyoto Station and taking the Karasuma Subway Line to Karasuma-Oike Station. From here, take the Tozai Line to Nijojo-mae Station. Kyoto Imperial Palace. Getting to Kyoto Imperial Palace is simple. Take Karasuma Subway Line to either Marutamachi Station or Imadegawa Station. Fushimi-Inari Taisha Shrine. You can get to the Shrine by getting off of the train at the second stop on the JR Nara Subway Line. The Kyoto National Museum. Getting to the Kyoto National Museum is very easy and is just a 25-minute walk from Kyoto Station. Katsura Imperial Villa. One way to get to the Katsura Imperial Villa is to take Kyoto City Bus #33 from Kyoto Station. Get off the muss when you reach “Katsura Rikyu-mae”. 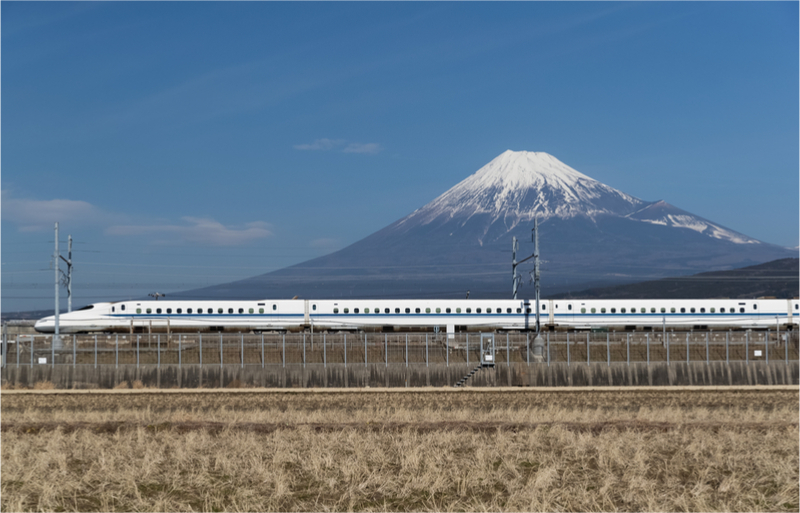 If you’re interested in getting from Kyoto to Tokyo, and vice versa, you can use the Tokaido Shinkansen; a highspeed railway line. For those who plan on travelling on the trains in Kyoto frequently, it’s a good idea to look into a Japan Rail Pass which costs about 14,000 Yen (roughly $124) which is a lot cheaper than buying a ticket each time you want to use the train. If you’ve spent your time in Kyoto checking out everything that you can possibly see, it might be worth taking a detour and going to Tokyo for a few days as well. Tokyo has a lot more to offer and as the capital of Japan, you can expect to be amazed. The skyscrapers alone are incredibly amazing and at night when all of their lights are turned on, it’s a magnificent sight that simply couldn’t be recreated. Perhaps take a few days out of your trip to Kyoto to stay in Tokyo and see what it has to offer as well! To wrap up, having a fantastic vacation doesn’t require you to invest months upon months of your earnings. As you can see from our travel guide to Kyoto, you can visit Kyoto and experience as much of the culture as possible without breaking the bank. Remember, as we mentioned towards the beginning of the article, make sure to get yourself quick, reliable Travel insurance too! Check out Budget Direct Insurance for your best deal. Such a useful post! Thanks for sharing! The food looks…. interesting.